Drummer Carlos Rodriguez is back again this year with Tjaderama! 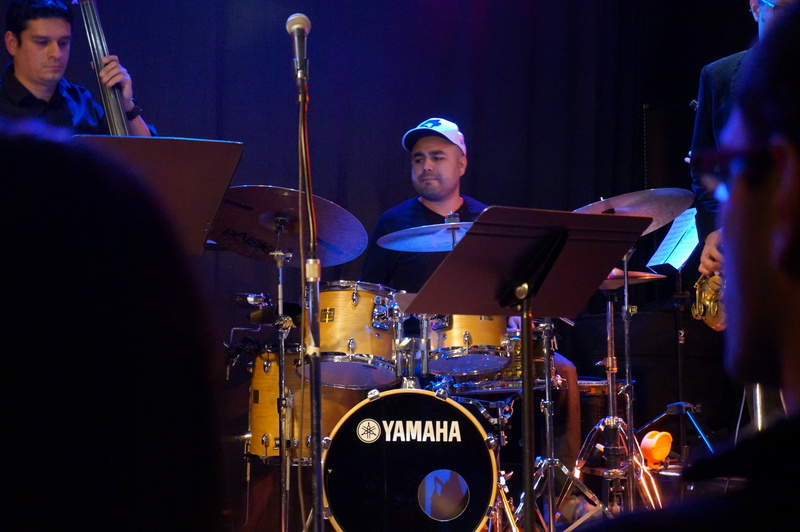 One of the most popular performances at the 2014 Steel City Jazz Festival was undoubtedly our Latin Jazz night, featuring vocalist Ashley St-Pierre and a band led by the fantastic drummer Carlos Rodriguez. It’s no surprise to me that so many people were interested in that show; the combination of jazz and Latin music is a time-tested, sure-fire hit! How could it not be? What’s there not to like about combining the improvisation and interplay of jazz with the complex rhythms of music from the Caribbean and Latin America? So when Carlos approached us again this year with the idea to feature a tribute to Cal Tjader, the legendary Latin jazz vibraphonist, we knew we had to make it happen! If you’re not familiar with Cal Tjader that’s okay, Tjaderama has you covered. The group’s leader, vibraphonist Randy Stirtzinger, has a deep knowledge of the history behind the music and will be sharing it throughout the night. As a big-time jazz history fan myself, this is one of my favourite kinds of performances. I’m a sucker for classic jazz stories, like Charlie Parker playing a plastic saxophone at his famous Massey Hall performance, or Charles Mingus getting fired from Ellington’s band after chasing the trombonist onstage with an axe. Although I’d hardly say knowing the history is necessary to enjoy the music, I think a little background helps connect the listener to the long line of performers and musicians who have played these songs before, and that’s a special thing. It gives each performance a little edge, and I’m thrilled that Randy will be helping us all connect with the music of Cal Tjader! Tjaderama are Randy Stirtzinger on vibraphone, Carlos Rodriguez on drums, Rob McBride on bass, Antonio Perez on congas and John Sherwood on piano. Join them Sunday, October 25h at 7pm to close out our first week of shows at Artword Artbar! Tickets are available now on the Artword Artbar website. Next Next post: The Koopa Troop: FREE Matinee Performance October 24 at the Pearl Company!